These are two legendary 1940s pictures belonging to the film noir genre. 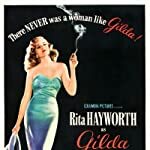 Each of the titles consist only of the name of their respective femmes fatale (played by Rita Hayworth and Gene Tierney), the mysterious women whose alluring, seductive and duplicitous characteristics will ultimately be the downfall of any man who is unfortunate enough to encounter them. Which of these films had you more enchanted?